Kam KWM1960 Twin Radio Microphones. The new improved design includes superior grip rubber coating on handheld microphone transmitter for low handling noise. Upgraded mic capsule for better audio quality. 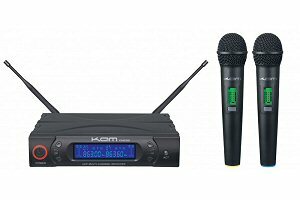 There are two versions of this twin radio mic system which use different frequancy bands. Frequency band known as “channel 70” is license free. Frequency band known as “channel 38” requires a license.